A security guard recalls the Olympian telling him everything was 'fine' after neighbors reported gunshots coming from Pistorius' house. PRETORIA, South Africa — In a day of damaging testimony, a former girlfriend of Oscar Pistorius said at his murder trial Friday that he once shot his gun out of a car sunroof and later cheated on her with the woman he killed last year, and a security guard recalled the athlete telling him everything was “fine” after neighbors reported gunshots coming from Pistorius’ house on the night of her death. The gripping accounts capped the first week of the televised trial of the double-amputee Olympian, whose chief defense lawyer has tried to sow doubt about the testimony of neighbors who said they heard a woman’s screams before gunshots. Proceedings have also focused on past incidents involving alleged gunplay, part of an apparent prosecution effort to portray Pistorius, 27, as a hothead who sometimes thought he was above authority. Prosecutors say he intentionally killed Reeva Steenkamp during an argument, but he insists it was a mistake, and that he fired through the locked toilet door in his bathroom believing an intruder was behind it. Moments later, Baba said, Pistorius phoned him back, started crying and didn’t say anything and then the line went dead. It was minutes after he shot Steenkamp, a 29-year-old model. “Not everything was in order as Mr. Pistorius was telling me,” Baba recalled saying to a fellow guard as they were outside the runner’s villa. Earlier, ex-girlfriend Samantha Taylor, who cried twice during her time on the stand in the Pretoria court, said Pistorius always carried a firearm when they dated and sometimes shouted angrily at her and her friends. 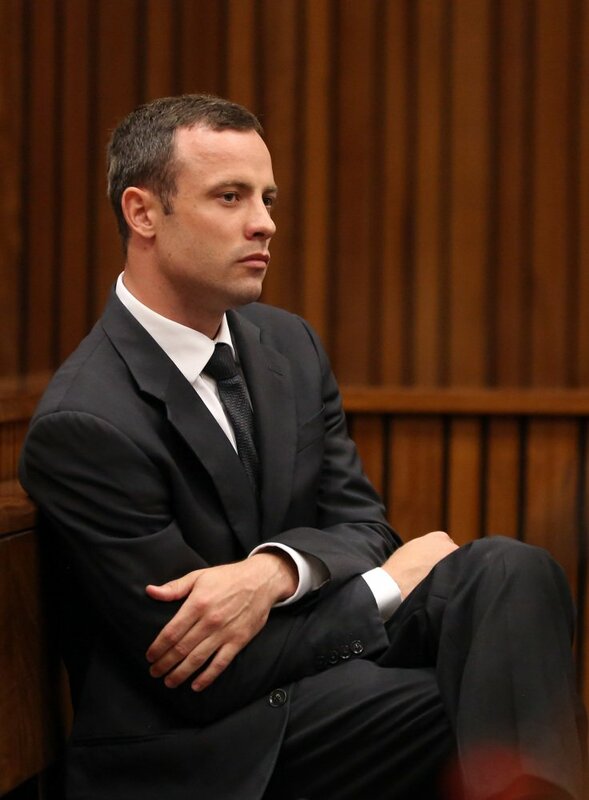 There were murmurs in court when Taylor said their relationship ended because Pistorius cheated on her with Steenkamp. Taylor said she started going out with Pistorius in 2011 when she was 17 and that the relationship ended in November 2012. She described some of Pistorius’ habits, including what side of the bed he slept on at home, the fact that he placed his gun on the bedside table or next to his prostheses on the floor at night and how he would balance against things if he was walking on his stumps. Pistorius was born without fibula bones because of a congenital defect, and his legs were amputated when he was 11 months old. He ran on carbon-fiber blades and is a multiple Paralympic medalist. He also competed at the London Olympics but didn’t win a medal. Taylor described one occasion in which Pistorius fired his gun out of a sunroof soon after a policeman stopped their car for speeding. She also mentioned another incident in which she and Pistorius were followed by a car as he drove home. “When we arrived at his estate, he jumped out of the car with his gun and held it to someone’s window, and then they drove away,” Taylor said. Defense lawyer Barry Roux raised the possibility that Pistorius was trying to protect Taylor, though she said did not feel threatened. Taylor also described problems in her relationship with Pistorius, the first amputee to run in the Olympics. “He cheated on me with Reeva Steenkamp,” Taylor said. The court later adjourned briefly after Taylor broke down in tears while describing how Pistorius had earlier cheated on her with a different woman, and then again when she cried while discussing her problems with him. Roux, the defense lawyer, said he would produce emails between Taylor and Pistorius to show that her testimony was untrue, and he also sought to highlight apparent gaps in Taylor’s memory of the alleged sunroof gunfire in September 2012. 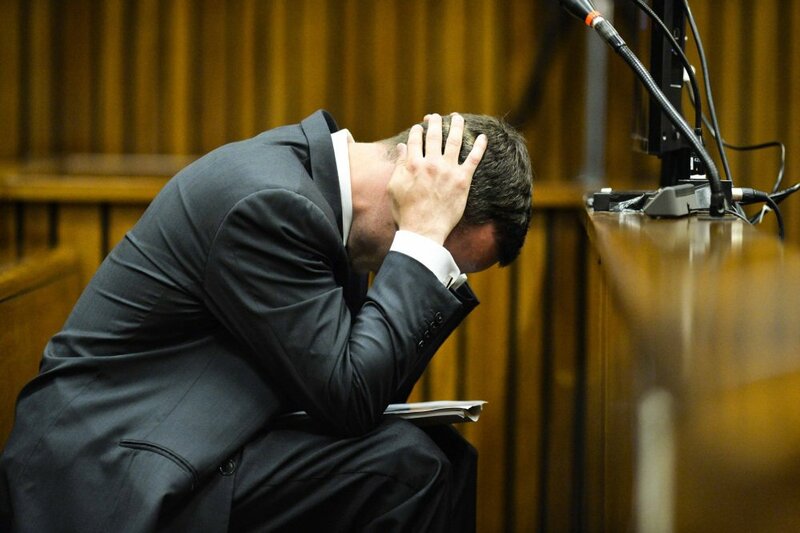 Roux said Pistorius denies the shooting took place. Taylor also described previous incidents when Pistorius thought there was an intruder trying to get into his home, saying he reacted by waking her up. But he woke you up, asked prosecutor Gerrie Nel. “Yes. There was probably one or two occasions when he woke me up to ask me if I heard something,” Taylor replied. Pistorius did not attempt to wake or locate Steenkamp before he shot her by mistake, according to his own version of events. On the night Steenkamp died, security guard Baba said he drove from the main gate of the gated community to Pistorius’ home with a colleague after neighbors called to report sounds like gunshots from that direction. A few minutes after Baba’s two brief phone calls with Pistorius, two other people showed up: Johan Stander, a manager of the housing complex whom Pistorius says he called to get an ambulance, and Stander’s daughter. The group went to the front door of the house and someone pushed it open. Baba said he saw Pistorius coming down the stairs, carrying the bloodied Steenkamp.